Using the veins of her proclaimed inspirations of fairy tales, freak shows and Victorian traditions; 'Treacherous Gardens' continues to explore the complexity of our dual natures, specifically the balance of our "inner" and "outer" landscapes and often manifested by perfectly balanced twins. Special Second Reception with the artist April 25th, 1-4 p.m.
'Shy Girl' 15 x19 Oil on wood, antique frame. San Francisco based painter Jennybird Alcantara is a pearl- handled dagger wrapped in black satin, proving with her successful new show that she is a force to be watched. Her new, large body of work, 'Treacherous Gardens' opened late last month at Varnish Fine Art gallery in her native city. The show features paintings based around a subversive yet delicious mythological world she has spent years cultivating and exploring. With each new show the mastery of her painting techniques, themes and detail orientation becomes breathtakingly elevated. 'Sugar' 6 x 7.5 Acrylic on paper. Throughout the body of work she alternates between tiny, intimate portraits and sweeping scenes set in brightly colored woodland landscapes or aquatic settings. Most of the work was created with oil and acrylic paints on panels, giving the work a slick, glossy exterior, other smaller pieces were created with black and colored inks on paper; many of which were framed in exquisite antique frames. Handmade dolls that were painted with the same painstaking attention to detail as the larger pieces sat as guardians on shelves between the paintings. Her broad color palette often served to highlight the relationship between the characters and their surroundings; the teal glow of the faces of some of the female characters resonated with the aquatic settings while the pink skies often smoothly contrasted with the dark narratives unfolded on the panels. 'Keeper of the Primordial Egg' 19 x 23 Oil on wood, vintage frame. Two twin swam-women hybrid creatures float in a muddy circle attached to a floating egg shaped and colored heart. 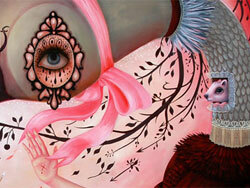 The heart with octopus like tentacles and the skeleton key are recurring symbols throughout much of Jennybird's work. Using the veins of her proclaimed inspirations of fairy tales, freak shows and Victorian traditions; 'Treacherous Gardens' continues to explore the complexity of our dual natures, specifically the balance of our "inner" and "outer" landscapes and often manifested by perfectly balanced twins. The narrative paintings feature an array of characters, many of which are hybrid beings; half or part human and half or part animal. The result is eerie, unexpected and surprisingly beautiful and further serves to convey the idea of connectedness and between our animal instincts and human emotions. Some of the figures, as in many of her past works, feature holes or portals in their bodies that have additional landscapes and scenes co-existing or conflicting with the external narrative. Often the threat of danger or death looms over the characters creating a feeling of anxiety and melancholy. These complexities allow the work to exist on many readable levels; the brilliant execution of the pieces is immediately aesthetically pleasing while the psychological threads and literary references create a deeper, communicative layer for the viewers. 'Hiding Place' 33 x 37 Oil on wood, antique frame. The head of a cloven footed and tattooed women is encased in a vintage birdcage while a wolf headed female simultaneously holds the woman's hand and opens the cage, creating a circuit between the two. 'Bird Watcher' 12 x 23.5 Oil on wood, antique frame. The profile of a swan legged female is painted like a sugar skull, suggesting the juxtaposition of death and the celebration of deceased loved ones. A raven's head protrudes from her dark eye, further symbolizing death within the piece. 'Daughter of Icarus' 13 x 16 Oil on wood, vintage frame. The one-eyed twin beings in 'The Daughter of Icarus' are at once bizarre but upon closer look, the melancholy narrative illuminates the myth of hubris the title is based on. 'The Futility of Escape Plan' 9.5 x 34 Oil on wood, framed. The square shaped paintings are joined to create a hybrid creature within its center. The structure of the painting is a manifestation of the hybrid, fantastical beings featured in all the paintings. 'Eye' 4.5 x 7 Oil on wood, antique frame. A tiny portrait of a tattooed eye. 'Sleep Walker' 30 x 60 Oil on wood. As one of the largest paintings in the series, "Sleep Walker' features a disembodied female figure whose eyes are veiled by blindfolded mermaids. The immaculate duality show here reverberates through nearly every piece. 'Treacherous Gardens' Diptych 28 x 31 and 32 x 34. Oil on wood, antique frames. 'Key' 7 x 9 Oil on wood, framed. 'Food for Thought' 7 x 9. Acrylic on paper, vintage frame. Here, a blindfolded women swallows the tail of her own hair. A black heart floats and bleeds below her cage bust. 'Struggle in the Garden of the Porcelain Queen' Diptych. 40 x 30 and 40 x 30. Oil on wood. The unfolded scene is laden with complexities. The three figures are all touching and therefore connected, yet its clear the central figure is in distress. The tip of one of her lacey tentacles has been dismembered and is bleeding beneath the candy stripped skirt of the swan necked figure. The black bear holds a skeleton key, a recurring symbol throughout the work, and seems to be the suit of a smaller female figure who is shown sleeping inside. 'Struggle in the Garden of the Porcelain Queen' detail. Installation view with handmade art doll.